Question: Hello. I am in need of a bulk oilfield water storage tank. I am working on a project and require storage of approximately 2 million gallons of water. What is the largest size pillow tank you offer? What kind of temperatures is it equipped to handle? Answer: For bulk storage of liquids (including process water, fracking fluids, and fuel), the best option to consider would be one of our large capacity collapsible pillow tanks. These tanks are economical, built to large capacities, and capable of handling almost any liquid. Standard tanks include models equipped to handle drinking water, gray water and fuel. All collapsible tanks are also fully equipped to offer a high heat retention, lowering heating costs. When compared to a standard oilfield storage tank, these tanks have approximately 50% higher heat retention. When compared to other styles of frac tanks, the collapsible tank offers a huge advantage in terms of sizing. 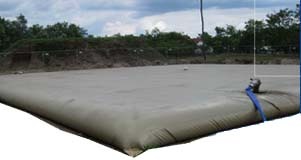 Standard oilfield collapsible tanks have been built in capacities as high as 210,000 gallons. As a quick comparison, a 210,000 gallon capacity is the equivalent of approximately 5000 BBL. While these tanks are significantly larger in terms of capacity, they still remain smaller and more economical to transport than a rigid tank unit. When transported, tanks are folded and occasionally even rolled up. This allows multiple tanks to be shipped in the same transportation container. 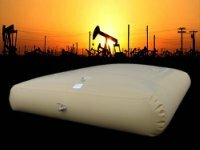 Learn more about how a collapsible pillow tank has operated as a Frac Tank.